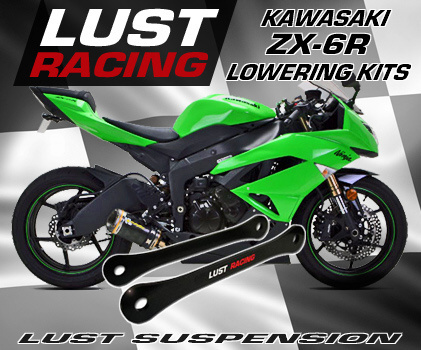 Lowering kits for Kawasaki ZX6R ZX600 / ZX6R 636 for year models from 1995 to present (2019) by LUST Racing. in the rear suspension .By lowering the rear suspension the seat height is reduced. High quality lowering kit made in roll forged steel stronger than the standard parts replaced. We offer various lowerings depending on year model of your ZX6R. Perfect fit. Finished in corrosion resistant powder coating, color black with LUST Racing logo in red and silver-chrome. Supplied with installation instructions. We have lowering kits for ZX6 models from early 1995 to present 2019 models. Please, select correct kit for your bikes year model, thank you!